I am currently taking a Science Methods course in my graduate level classes in which we have had a heavy focus on inquiry-based learning. I was wondering how beneficial and or effective inquiry-based learning can be at the younger elementary school grades (K-2)? What are some ideas for incorporating this type of learning in these specific grades? I believe that inquiry based learning is also extremely beneficial for students especially at the lower elementary grades. Like mentioned by others, this type of learning helps the students think for themselves. There are also different types of inquiry based learning, depending on how much direction you would like to give the students. If you are going to completely hand over the reins to the students this is called an open inquiry. In this inquiry the students will be in charge of coming up with a question/problem, procedure, and results/ analysis. This would be a great way to get the students to think creatively and problem solve. However, for the younger students it could be hard for them to come up with everything on their own. So, for this age group I would recommend a structured inquiry. For this, you as the teacher would come up with the question/problem, and the procedure for everyone to do. Then the students would have to analyze and reason as to why these things occurred. In my science methods class we did an experiment called "dancing raisins for our structured inquiry. We were given the question of, "Why do raisins, when added to a cup of sparkling water float to the top of the cup?" We were also given the procedure of putting five raisins in two cups with the same amount of liquid, one with sparkling water and one with regular water. Then it was our job to analyze why it was that the raisins floated in the sparkling water. I think that this would be a great idea of a structured inquiry for younger elementary grades. You can structure it, but still gets them thinking! Kevin, I am in my first semester of student teaching at an elementary in Houston, Tx. The school has recently moved to a IB curriculum. I am working with 5th grade students and I have to agree with the other posts that it would definitely be to your best interest to guide the questioning. The students, even 5th grade, often have a hard time focusing on specific aspects that are necessary to move forward with the lessons. Hi Kevin! I am currently taking Teaching Elementary School Science, as an undergraduate. I also love using the 5E lesson plan/model for any lesson I want to teach in any subject! I saw that others mentioned it before me but I thought I would dive deeper into it for you! If you are not familiar with the model, it breaks the lesson down into 5 parts. The lesson plan starts with the [b]Engage[/b]. This is where you want to [i]capture the students' interest[/i], help them to make connections with that they know and can do, and the teacher provides an orientation to the lessons. It is also important to assess the students' prior understanding of the concepts you will address in the lesson. Next, the [b]Explore[/b] phase, you will have the students do a [i]hands-on activity[/i] to to explore the concept further. During this phase the [u]teacher, you, needs to keep their hands out! [/u] You want the students to define the problem/phenomenon in their own words. The third phase, the [b]Explain[/b] phase, is [i]teacher centered. [/i] This is where you will [i]teach the concept that you want your students to learn. [/i] You can do this through demonstrating, lecturing, reading, or through video or computer-based media. The [b]Elaborate[/b] phase follows the Explain phase. Here the students will e[i]laborate on their understanding of what you just taught[/i]. Ideally you want the [u]students to interact with each other[/u] so they can discuss their ideas and construct a deeper understanding of the concepts. The 5th and final phase is the [b]Evaluate[/b] phase. This is where your students can further elaborate on their understanding of the concept, you what they know now and what they have yet to figure out. It is important that you follow these steps in order. You can [b]not [/b]rearrange the order! I am in class with Kennedy, who posted before me, and I completely agree with what she has to say! If you take what she said and implement using the 5E lesson plan you are golden! There are so many essential features of science inquiry, here are three that I really like: [ol] [li]The learner engages in scientifically oriented questions. [/li] [li]The learner gives priority to evidence in responding to questions. [/li] [li]The learner formulates explanations from evidence. 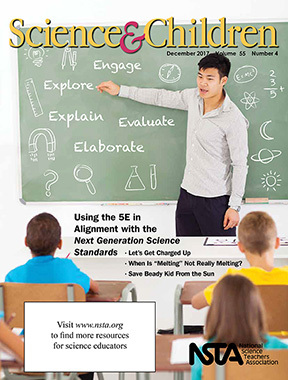 [/li] [/ol] I have attached a short article regarding Next Generation Science Standards and 5E Lesson Plans. Hi Kevin! Recently, I have learned a lot about inquiry based learning and how to incorporate it into my lessons. The one thing to remember is that there are four different levels of inquiry based learning. The lowest level is Confirmation Lab. This is where the teacher provides the problem, procedures and results. The next level is the Structured Inquiry. The teacher is responsible for providing the problem and the procedures, the student is responsible for providing the results. Next, is the Guided Inquiry. In this one, the teacher only provides the problem/questions and the students are in charge of providing the procedures and the results. The highest level of inquiry is the Open Inquiry. This is where the students are in charge of everything. The students are the ones that produce the question, they create the procedures to answer the question, and they obtain the results. Open inquiry could be challenging for students K-2, but it definitely is not impossible. Guided Inquiry could also be used with this age group. However, this inquiry could be more challenging with the age group. After you give the students the question, you could have them discuss in a large group what steps they would have to follow to answer the question. This way you aren't giving them the steps, you are allowing them to work together with you assisting if needed. This activity could be used to answer questions related to the seasons or animals. Structured Inquiry might be the best way to incorporate inquiry based learning into your classroom. This way you could give the students the question they need to answer and the procedures they need to follow, then the students can conduct the experiments in their groups. This way you are allowing your students to complete the experiment on their own, but you are providing the structure of the assignment since the age group is so young. Kevin, Like others have stated, inquiry in the classroom is very important. In my experience throughout my schooling in Elementary Education and working as a lead teacher in a daycare, I have learned just how important inquiry is to a child's learning. Not only in science but all aspects of learning, I feel that it is important to involve some type of inquiry. A huge part of a child's learning and understanding is their thought process and carrying out that process themselves. As teachers it is hard sometimes for us to let students struggle and not provide the correct answer. However, this is important for students to go through to work through problems and figure them out themselves. Based on the age and development of the children depends on what exact type of inquiry to use to prompt the children. Starting at the lower grades using Confirmation Lab Inquiry, moving up to Structured Inquiry, Guided Inquiry and then the highest level of Open Inquiry for the higher grades that can do most of the thinking for themselves. All four of these inquiry based learning approaches give the students some accountability of their own learning. Hi Kevin, As others have stated, inquiry based learning is very beneficial for all grade levels. I feel as though some of the high levels of inquiry are more beneficial for the higher elementary, middle and high school age levels, there are many of the lower levels of inquiry that are more appropriate for the K-2 grade levels. I think that in order to incorporate inquiry based learning in these grades you need to have a focus of using confirmation in the kindergarten levels and then moving towards a structured and guided approach for the 1st and 2nd graders. With these particular levels of inquiry based learning the teacher is providing some guidance for the investigations, but not completely leaving it open to the children's decisions. The fact that they have a portion of the investigation that is solely theirs is very important for them to build their education levels and further their learning in science and defining skills. Kevin- I am in an Elementary School Science class, as an undergraduate at UNI. I have loved learning about all of the inquiries there are in science! I believe that inquiry based learning is very beneficial for students especially in the lower elementary grades. Kevin, there are also different types of inquiry based learning, The lowest level is Confirmation Lab; this is where the teacher provides the problem, procedures and the results. The next level is Structured Inquiry; the teacher here is responsible for providing the problem and the procedures then the student is responsible for providing the results. Guided Inquiry is where the teacher only provides the problem and the questions and the students are in charge of making the procedures and coming up with the results. The highest level of inquiry is Open Inquiry; this is where the students’ make the question they come up with the procedures to answer the question, and they finalize their results on their own! I know others had mentioned some of the inquiry based learning’s but I thought it would be beneficial for you to see and have them mapped out! I also like that Keaton stated the 5E lesson plan/model! Because I too have loved getting to use this method and learning more about the 5E’s! The 5E’s would also help in planning a specific inquiry/lesson for your students! Good luck! Hi Kevin - I am an undergraduate student at the University of Northern Iowa studying elementary education. Additionally, I grew up in the era of No Child Left Behind from the beginning of my k-12 education to the end. I first want to reflect on what my experience in science was through NCLB. No Child Left Behind told me what was important across the curriculum. Specifically in science, I was told what experiments to do, what we were testing, how to set them up, and then I was presented with the data I should have collected from the experiment. The experiments didn't peak my interest in the least; therefore, my interest in pursuing a STEM major went out the window before I truly understood what it meant to be a scientist. As I learn the future of education through my degree, I believe inquiry based education must start early to engage students in critical thinking and exploration. When students have a say in their education, they have ownership and an authentic investment in seeing it through. At younger ages (k-2), it may be best to engage in guided inquiry. This enables teachers introduce and focus students on a particular phenomena, and it allows children to engage in higher order thinking skills through authentic experiences. Hi Kevin! Inquiry based learning is important, even in the younger elementary grades. When students engage in inquiry based learning they are developing problem solving abilities and critical thinking skills. Students learn to take ownership over their own learning. Inquiry-based learning provides student the opportunity to practice using creativity and collaboration. To help students learn the routines of science inquiry, you can begin the year with structured inquiry. The structured inquiry model allows the teacher retain more control over the experiment. As you and the students become more comfortable with the procedures of inquiry, you can gradually release control. Guided and open inquiry models allow for increased student autonomy. When creating science inquiry lessons, you should have students explore natural phenomena they encounter in everyday life. This will increase engagement as students can apply their background knowledge to the creation, exploration, and explanation of an experiment. What a great question! I hope this helped! Hi Kevin, As has been stated previously, inquiry based learning is very important in the elementary grades. Rather than just having students learn outcomes, it allows them to dig deeper into the concepts by letting them explore and understand the processes. When inquiry based learning is first introduced in early elementary, it can’t just be introduced all at once to the students and have them be responsible for all aspects of inquiry, that would just cause confusion and frustration. Inquiry based learning must be introduced gradually. Starting with the teacher providing all aspects of inquiry. The students can then find the solutions by themselves, working all the way up to Open Inquiry, where students are responsible for coming up with their question, the steps for the experiment, and the solution. I firmly believe that inquiry based learning is the best way to teach/learn science. Starting by having your students ask questions about science or what they are working on creates an environment to explore more than just one avenue of science. Using just facts only allows students to discover that specific avenue of science. In my classroom, I will have my students start individually asking questions about science or what we are working on. Then I will have them transition into small groups. Finally, I will have them come together as a large group and we will explore all of our questions about science. I believe this is a great way to teach/learn science because it allows students to discover science from where they are at. I am just learning about inquiry learning for elementary students. I think that if implemented correctly it should really help a student to start reasoning and to start thinking critically when it comes to science. I am used to science experiments when I was in school and they would give us step by step directions to come to a final thought. I felt like I was learning but now that I am older and I start to think about the topic I was taught, I realize that I do not really know much more than what was given to me. I can follow steps and be content that I learned something new but not really making any other connections which is what science should be about. Like you, I want to be a resource to my students and provide them with something to get their brains thinking. I hope to learn more about inquiry and what science experiments are more beneficial. It is good to know that others have the same questions as I do. Inquiry-based learning is very beneficial for younger elementary students! Having the students engage in activities that they can relate to helps them understand the science context behind it better, instead of just giving them some definitions and concepts. This allows them to actually learn as they are doing. I am also learning about inquiry-based learning in a Science methods course. I personally think that inquiry based learning is beneficial because it allows the students to take more charge with their learning and isn't so set in stone. This allows the instructor to learn alongside their students since you don't know where each lesson will take the class. I recently learned about the KLEWS method with inquiry-based learning. It is similar to KWL but specifically for science classes. It allows the students to write down what they think they Know, what they are Learning, what is the supporting Evidence, what they are Wondering and leastly, what are the Science concepts that they are using. I believe this model is excellent to use because it allows students to go more in depth with their thinking. Hi Kevin! I am an undergraduate at the University of Northern Iowa studying elementary education. Right now, I am taking a science course that deals with how to teach science to elementary students are we are actually on our unit that is about inquiry. Science has never been my strong subject and as a child, I don't remember doing a lot of science experiments in the classroom. But science looks a lot different today than it did 15 years ago. I believe that inquiry-based learning is very beneficial to all students but especially lower elementary. First, it is very hands-on and lower elementary students need hands-on activities that will engage them and excite them. I know from prior experience that children learn better when they are actively engaged and participating in instruction. Inquiry-based instruction does the trick. Using inquiry-based instruction gets the students thinking on their toes and figuring out what is actually happening in their experiment and why it is happening. Students are able to plan an investigation, predict what is going to happen, carry out the investigation while observing, and finally find evidence as to what happened and if your prediction was correct. There are four different types of inquiry; confirmation, structured, guided, and open. In a lower elementary class, I would use structured or guided. The difference between these two are simple. Structured inquiry is where the teacher poses a question and the steps to complete the investigation while the students have to observe what happens and explain what their thinking is. Guided inquiry is where the teacher poses a question and the students get to plan and carry out the investigation. Throughout all inquiry, students are asking and answering questions which are very important because it keeps the students engaged and thinking. Inquiry-based science instruction is hands-on, engaging, encouraging, ongoing, and requires interacting with others. Inquiry-based science instruction is very important and will show its great effects of being beneficial to both the students and the teacher. Hi Kevin! I am currently talking Methods of teaching Science as an undergraduate at the University of Northern Iowa. We currently just learned about the inquires there are in science. I loved learning about them. I personally believe that inquiry based learning is very beneficial for students, especially in lower elementary. In science they are different types of inquiry based learning. The lowest level is Limited/Confirmation lab, this is where the teacher provides the problem, procedures and the results for the students. This is very helpful for your students who are just learning about science. The next level is structured inquiry, this is when the teacher is responsible for providing the problem and procedures and the students provide the results. Guided Inquiry is where the teacher only provides the problem and questions and the students are in charge of making the procedures and results. The highest level of inquiry is Open Inquiry, this is where the students' make the question then they come up with the procedures to answer the question, and then they finalize their own results. I know you were very interested in learning about inquiry based learning but I think the others are very beneficial for you to see. This would help you plan a lesson for a specific lesson! I attached a link at the bottom that helped me understand the different levels. I wish you the best of luck! Hi Kevin! I am a senior at the Univeristy of Northern Iowa! I am in my Methods of Science class and we have tealked a lot about inquiry based learning. Inquiry based learning is absolutely beneficial for grades K-2. It is beneficial for all grades! Inquiry based learning is a very active form of learning. Inquiry based learning helps our students to develop information processing skills and problem solving skills as well. This not only helps them in school but these processing skills and problem solving skills will help them throughout their entire life. In grades K-2 inquiry based learning could be anything from exploring possible solutions to a question or problem to evaluating and assessing their understadnings with the help of using evidence. It is crucial for inquiry to be introduced to students at the k-2 age. Inquiry has several different forms, and should exist in k-2 classrooms. Depending on the grade, students and their background knowledge the different kinds of inquiry may be more efficient. The four types of inquiry are open, guided, directed and confirmation labs. These styles of inquiry progress from the most to least student lead, and at a younger age students may need extra guidence. At these younger ages students may need help faciliating discussion and thinking, and as an educator you can guide discussion about the topic, question, procedure and analysis of a given topic. In the curriculm course that I am currently in, our teacher performed an inquiry based lesson about what objects sink and float. This would be an activity that you could easily introduce in a k-2 classroom. Students would be able to formulate and record their own POE, or Predictions, Observation, and Explaination, for each fruit that either sinks or floats. Our professor made this inquiry based as she just guided discission and student wonderment about each fruit. Our class practiced using a KLEWs chart to scaffold the direction of our learning. KLEWS is similar to a KWL chart, and was a vital part of our science inquiry. Below I attached a picture of an example of a KLEWS chart, the image and more information can be found in the previous link. The following scholarly article discusses the relevance of inquiry based in k-6 classrooms that I found very beneficial! I am currently studying Early Childhood education and taking a Science Methods course. We have also been talking a lot on inquiry based learning and the different types of inquiry based learning. I personally haven't seen it done yet in schools but from what I've learning in my class and videos we've watched the inquiry based learning can be very beneficial because instead of the traditional lecture based science class students are able to explore a science question hands on. Students benefit a lot more when they experience something first hand try to figure out their own answers and not just read about or have the teacher directly state answers. A good way to incorporate it for example in elementary school would be to incorporate guided inquiry. In this type of inquiry a teacher would pose the science question that he/she wants the class to explore and provide the materials. The students would then brainstorm their ideas and come up with ways to solve the problem. They could work in teams or as a large group with this inquiry. Students would also come up with their own reasoning as well as to why something may be happening in their investigation. I am working a lot with inquiry-based learning and how to incorporate it in a classroom with my courses right now. I found this link that is awesome. It is from a social studies magazine, but it incorporates inquiry-based learning and science. Even if you don't use this lesson exactly, I like the six phases that are outlined in here that can be transferred into all inquiry based lessons. Also, I think it is easy to underestimate what early childhood kiddos can do. In this article second graders are building a model house and they learn so much from it. Having students create their own compelling question really does keep them involved in the process and gives them some responsibility for answering their question. I believe that inquiry-based learning can be very beneficial for younger elementary school grades. It helps them take their natural wonders about the world and use the scientific process to help them explain these wonders. About a year ago, I had the opportunity to teach inquiry based science units to second graders. One of these units was about matter and how you can recognize the states of matter through their properties. I started off with the lesson by bringing many different objects that were solids, liquids, and gases. I asked them to sort them in groups to see how they would do it. They started out by grouping solid objects by size and color but when they got to liquids, gases, and baking soda they were very perplexed. They eventually wanted to sort them by their states of matter even though many of them didn’t really understand this concept yet. We then went into the process of writing down what makes these things similar and what properties they have. The students had a lot of trouble with the baking soda. They thought it was a liquid because it moved around in it’s container but once I gave them a magnifying glass they explained that it was just tiny rocks. As the unit went on we dealt more and more with states of matter and we eventually talked about how states can change. Many people don’t believe that students this young can do inquiry-based science but if you support them and give them an opportunity to explore they will start to come up with their own hypothesis on how the world works and that is exactly what “real scientists” do isn’t it? Hi Kevin, I believe that inquiry based learning in science is very important, especially at the younger elementary level. Even though there are some terms in which younger students may not understand, demonstrating them or having them do them will help them to get a feel for the process of a scientific experiment. A teacher will be able to introduce terms later in the educational process, or could even do so within the experiment. This will allow students to get a real idea of what it looks like, rather than simply reading about an idea or being told about it. Overall I feel as though inquiry is an important part of sciences, especially in younger grades. As for incorporating this into the classroom, I feel as though an experiement with the germination of a seed would work perfectly with this. Students can make predictions about what will happen to the seed and come up with their own ideas. This will introduce them to the scientific process while giving them hands on experience. I think it is very important to start students off with inquiry based learning. Even at the Kindergarten level students can use more teacher guidance for lessons but it is much better than the traditional style of learning. The traditional style of learning really limited how stuents understood content. Inquiry based learning is taking a different apprach that helps students look at learning and science in a completely new way. Our hope as educators is to have all students walk away from the class with a strong understnading and I think inquiry based learning is a much better strategy. For really young students the teacher would probably have to create the lab or inquiry more for the students to follow but that doesn't mean the students can't use prior knowledge and resources to try and answer the question. I would probably create the question and give them a scenario to possibly solve the question. But I would also give them a lot of different ways to test their ideas. I would like students to come up with their own ideas for why something happens and then try and work together in groups to figure out how to test their ideas. Students can do a lot more beneficial learning when they are thinking and testing and coming to their own conclusion. They are much more likely to remember something that they thought of and tested than something a teacher just told them. Hi Kevin, I am currently attending the University of Northern Iowa and in my last year. Currently we are learning about how inquiry-based learning can be an advantage to helping students learn. I think there are a couple ways to look at inquiry-based learning in elementary. Being in the education field we know that not all students think the same exact way and not all learn as quickly as others. My sister is a middle school science teacher. After talking to her and reading a few articles I have come up with the following analysis. There are few things to keep in mind. As I previously stated, kids learn at different speeds. A lot of times many feel like they will not come up with the right answer. It is in my opinion that students be grouped together based on their abilities and knowledge. Then come up with different examples each group can work through. One of the biggest downfalls to this style of learning is that the kids at such a young age don’t have the ability to have previous knowledge to use. This could cause them doubt, but if we come up with multiple examples they know that they won’t be compared to another groups and allows them to relax. Another key to having young students use this method is to have a somewhat of a structure they can follow. If they don't have anywhere to start they are behind before they start. As the students get older, the structure can be slowly lost while they get more prone to strategically thinking. What I have also learned is that the sooner we can get students using the inquiry-based system, the better off they are in the future. If we only learn problem solving through a book with a set of instructions on how to think, they can be set up for failure when they are out on their own as college students and even adults in the work force. Life doesn't have a single correct answer to every problem, kids must learn how to think their way through a problem, and to me, inquiry-based learning is the best method. Hi Kevin! I am taking a science methods course with University of Northern Iowa. I would say that using inquiry-based teaching is crucial to an elementary science classroom. This is especially true for younger students, who are just developing their understanding of science. I read the article, "Inquiry Made Easy," written by Wendy Pierce, she states, "Although I believe students should have the opportunity to experience open-ended inquiries, I understand the complexities of teaching. Approaching new teaching strategies slowly will likely create lasting science reform." Meaning, the more effort we put into our lesson plans, the longer this technique will stick around. This is technique lets students have a better understanding of the material because they are coming up with the questions, doing the experiments, and recording their findings. It develops an interest in science, which I wish I would have had in elementary. I remember the long, drawn out science classes that consisted of just simply writing down notes and memorizing them for the test. Then after the unit, the information would fly out of my head. If students are allowed to do inquiry-based practices, they will have that information in their head for longer than just a unit. They can see a question on the test, and think back to the experiment that they did a week ago. I practiced inquiry-based teaching of science over the summer. I worked as an elementary lead teacher at a daycare. We did a simple experiment of filling two cups with water, adding baking soda to each, and a string that had one end in each cup. We had the students predict what would happen, observe what we happening each day, and if their predictions were right. Once the baking soda created crystals on the string, we had them ask questions on why this was or what they wanted to try next. After that experiment, they wanted to try more. I think one of the most important things of inquiry-based instruction is that it gets kids excited about science. You can try very basic inquiries for younger children, and they will be focused and wanting to know more! Hi Kevin! I am also taking a Science Methods course, but in my undergrad classes. We are learning a lot about inquiry based learning and how we can incorporate that into our lessons. There are essentially four different levels of inquiry based learning. The lowest level is called Confirmation Lab. The teacher essentially provides everything; the problem, the procedure, and the results. The next level is Structured Inquiry. In this, the teacher provides the problem and the procedures, but the students provides the results. The next level is Guided Inquiry. The teacher provides the problem or the question, but the students provide the procedures and results. The last, and the highest, level is Open Inquiry. The students are now in charge of everything; the problem, the procedure, and the results. This is what you will mainly see in grades 3 and up. This can be difficult in K-2, but can definitely be used. Based off all this information, inquiry in the classroom is extremely important to a child's learning. Their thought process in the moment is what leads them to carry out that process by themselves or in groups. If it is their question they are trying to figure out, they may feel more connected and want to figure out the answer more. This gives them accountability to their own learning and keeps them engaged throughout the whole process. No matter the grade, inquiry based learning can be used in each classroom and is extremely beneficial. Hi Kevin, I am currently taking a Teaching Elementary School Science course at the University of Northern Iowa. I personally think inquiry-based learning is very important for the younger elementary grades. Rather than the typical teaching methods of giving the students the outcomes, inquiry-based learning allows students to dive deeper into the concepts by having them explore and understand the process. I have recently learned a lot about inquiry-based learning, especially the different levels of inquiry. The lowest level of inquiry is the confirmation lab where the teacher provides the problem and/or question, procedures and results. The next level is structured inquiry where the teacher provides the problem/question and the procedure, but the students provide the results. Guided inquiry is another level where the teacher only provides the problem/question and then the procedures and results are provided by the students. The last level is open inquiry where the students provide all the problem/question, procedures, and results. I would recommend using structured and guided inquiry in the primary grade levels, (K-2). I think structured inquriy would work best with kindergarteners, because they might need some help and direction on the problem and procedures. Guided inquiry can be effective in 1st and 2nd grade classrooms, because the students might need help on providing a problem or question, but can execute the procedure. From my personal experience in elementary school, I was more engaged when I was investigating to find the answers to my own questions. It also helped me remember the content for future reference. Lastly, I think it is essential to have students explore natural phenomena that they will encounter in everyday life. By doing this, they will increase their engagement and add to their previous knowledge to the exploration and explanation of an investigation. I hope that my post and others are useful for you! Inquiry-based learning is a topic that has been newly discussed in a course I am currently enrolled in. I am an undergraduate student at the University of Northern Iowa majoring in Elementary Education. The course in which I am enrolled is a science methods course for pre-service teachers. We have been discussing a lot about inquiry based learning and the positive effects it has on students. When providing students with inquiry-based learning students are able to deepen their understanding, make research meaningful, and it empowers student voice. I have attached a link which discusses more benefits of using inquiry-based learning. There are many different ways to incorporate inquiry-based learning into the classroom for all ages. As an educator, I have a list of five strategies that help education professionals incorporate this learning strategy into the classroom. 1. Study your lesson plans. 2.Think of an Essential Question. 4. Gather all of your responses. Being in my Teaching Elementary School Science, I have come to learn that inquiry-based science adopts an investigative approach to teaching and learning where students are provided with opportunities to investigate a problem, search for possible solutions, make observations, ask questions, test out ideas, and think creatively and use their intuition. In this sense, inquiry-based science involves students doing science where they have opportunities to explore possible solutions, develop explanations for the phenomena under investigation, elaborate on concepts and processes, and evaluate or assess their understandings in the light of available evidence. This approach to teaching relies on teachers recognizing the importance of presenting problems to students that will challenge their current conceptual understandings so they are forced to reconcile anomalous thinking and construct new understandings. These first few weeks in the course, our professor has engaged us in inquiry-based learning. Even as college students, the inquiry experienced we've been involved with has challenged our thinking by engaging us in investigating scientifically orientated questions where we learn to give priority to evidence, evaluate explanations in the light of alternative explanations and learn to communicate and justify our decisions. It hasn't been all that easy, but you can see how engaging everyone becomes, we even have to like bring our creative elementary school self out to help. I would say that at any age teaching inquiry based lessons requires a teacher to excite and engage students' attention so that they want to investigate the topic.However, teaching it in the lower grades, the way teachers actually teach it has to be more hands-on, directive or guided, and concrete. Hi Kevin! I am an undergraduate at UNI taking a course on the Methods of Teaching Science. We have been talking a lot about inquiry-based learning, the different levels that comes with it, and the benefits of it. There are five different levels of inquiry in science education. Each of these comes with different levels of freedom for the student. The first level is limited/confirmation inquiry, in this level of inquiry the teacher has most of the control over the procedure that is taking place. The next level is Structured inquiry. In this level the teacher again has most of the control, however the students have a small say in what the results are from the investigation they took place in. The next level is guided inquiry. In this stage, the students start to have more control of the procedures they are going to be doing, the results they come up with, and the conclusion they decide upon. The next level is Teacher-directed inquiry. In this level the students have a lot of control, but do not get to decide what the topic is going to be. In the last level of inquiry, student-direted inquriy, the student and teacher pick the topic of the lesson, and the students have control of the rest. I believe that the benefit to the last form of inquiry is that it leaves the students to really explore what they are learning about. They aren't just given all of the information; instead they really have to explore and work to figure out the answer. This is why I believe inquiry-based learning is so important. It lets the students really explore the investigation and take control of their own learning. You could easily incorporate student-directed inquiry into all of those grade levels. However, it may be difficult for them to come up with the topic since they are younger, so teacher-directed would also be great for them. It depends on the students background knowledge of the concepts they are learning and their ability to formulate questions. Hi Kevin, my name is Macie. I am a senior at the University of Northern Iowa. In my science methods class we have been talking a lot about inquiry based learning. We have even done some experiences where we (as the students) are the ones doing the experiments. Inquiry based learning, I think, is very beneficial for students in the lower elementary grades. This gives the students a chance to be more involved with their learning, and really take charge in what they are learning. It also lets the students be more creative because they have to be the ones to ask questions and plan an experiment. I think we could easily incorporate inquiry based learning into every grade, it might be more difficult with younger grades like kindergarten and first grade, but this will also help to introduce the students to inquiry based learning right from the start. With the younger grades students might need more guidance in getting to some specific questions and knowing how to plan and set up an experiment. Hello Kevin! I saw your post about why we should use inquiry-based learning in the classroom and how it was effective! I thought I would share some insight on what I've learned so far. I am currently a senior at the University of Northern Iowa and taking my Science Methods course. We are currently learning about scientific inquiry, and after learning about it, I am excited to incorporate into my future classroom as a lower elementary teacher. I'll start off by explaining what is it and ways you could use this in classrooms. The different levels are open, guided, directed, confirmation inquiries. Confirmation is mainly teacher focused and also the teacher to show the students the way during that project. The next one is directed, this is where the teacher provides the information and the procedures and let the student find the answers and results. The third level is guided where the teacher provides the question and allows the students to conduct the procedures and results. Lastly, is the Open inquiry, this is where the students from start to finish conduct all of the posing of questions to answer their own questions that could be backed up with data. For a lower level of elementary, it will be more of confirmation and direct because I want the students to find the information that we will be discussing. I want to incorporate this into all age levels because it allows students to have their own data and questions and be able to be hands on. With young kids, they tend to learn and do best when they are involved with their hands or doing an activity this type of learning can help support their learning and keep them interested in the topic. I've attached a picture to this to give you some words that come to mind when I think of science inquiry and ways it could spark an idea for you to be able to use. I am currently an undergraduate at the University of Northern Iowa with a major in Elementary Education. I am in an Elementary Education Science Methods class and we have been talking about inquiry-based learning. I have learned in my class that inquiry-based lessons are a very beneficial tool for elementary grade students. Inquiry-based learning allow students to be engaged throughout the whole lesson by making predictions, analyzing data, and participating in discussions about their reasonings and evidence. Discussions promote collaborative learning for students and give them a chance to view other ideas and reasonings. Teachers are then able to expand student learning by asking students questions that promote deeper thinking. Overall, inquiry-based learning present students with the opportunity to develop problem solving skills as well as a meaningful understanding of the science concepts being taught. Kevin, I am an undergraduate student taking an elemenrary science methods course and we are learning about the how great inquiry-based learning is! There is a model called the 5-E which has been mentioned in previous replies to your post and it is very helpful in lesson planning! Inquiry-based learning is the complete oposite on how I was taught in school, so science was never one of my favorite subjects. When I become a teacher I plan to base my science lessons or incorportate inquiry-based in all of my lessons for my future students. Inquiry-based is where students are able to explore on their own, instead of the teacher telling them what they should know. I am also in currently in a Science Methods course for my undergraduate. We learned about inquiry based learning and all of this is very new to me. I wish that this would have been implemented when I was in school. Before inquiry based learning became a "thing" there was the teacher who gave the experiment and then told us there was one outcome and how it was supposed to go. Inquiry based learning is about letting the students figure out for themselves what the solution is. Obviously younger grades you have to make modifications to some of the things you are trying to teach. You might have to come up with the question you want your students to investigate, but the students figure the solution out by themselves. I think this is an awesome way for students to learn, and I think that I would enjoy science much more if I was allowed to explore and do experiments to solve a problem. This is a ways for students to become more involved in their learning and to take charge and think of ways to solve problems, while providing evidence. As an Early Childhood Education major looking at the effectiveness of inquiry based learning on younger students has been of special interest to me as well. In my curriculum class we talked about Project Based Learning. This is the idea of taking what children are already interested in and creating a project based on that and even letting the students guide and determine what happens in the project. To me, Inquiry-based learning is basically the same thing just geared specifically toward science. I got the opportunity to do a PBL project with a group of three and four year olds last year and was amazed by how much they learned while having experiences that answered their own questions. I was also amazed by how many standards we were able to cover even though they were the ones guiding the direction the project took. I think that if we give young children the opportunity in science to ask the questions that they have about science we would see the same kind of growth and I believe we would still be able to teach the science standards and concepts that are required. I think this is a great way to teach young children and to get them interested in learning about science for the rest of their lives. Below I have included the citation for the textbook we used to guide our project based learning project. Helm, J. H., & Katz, L. G. (2016). Young investigators: The project approach in the early years. New York, NY: Teachers College Press. I am currently in a Science Methods course for my undergraduate degree and we recently learned about inquiry based learning. After reading some other responses I would have to agree with having the questions be lead by you but let the students carry out the work and experiments. If the class you are teaching seems to have a great understanding of creating questions based on the topic, let them lead from the very beginning and create the questions themselves. In my class, we just did an experiment over things that float and things that don't. I think that would be a great topic to do for lower level and base it on age appropriate questions and objects. You can also tie in childrens books and do activities that would be beneficial for the age level you are teaching! Hello Kevin! I currently am a student at the University of Northern Iowa and studying to be a teacher. I am 100% on board with inquary based learning. I think that it is the best way for students to really learn what we are teaching in our science classes. The hands on and student driven structure behind the inquary classrooms are the key parts to it. When we really invest and dive into the inquary based learning a really feel like this is where the students will get the best long term retainment of what we are teaching, much more so than just a simple lecture. I am really excited, as a future educator, to teach in an inquary based classroom and to have that be the basis of my teaching. Hi Kevin, I am a senior at UNI studying Early Childhood Education. I am in a Teaching Elementary School Science class currently. We have been learning that students can use models such as Claim, Evidence, Reasoning (CER). Predictions are also another way that students have to think about the possible results and use their own reasoning before they see any results. The results may solidify their thinking or change it dramaticly based on the results. Within the classroom, I would recommend given students the space to do some pre-evidence thinking in which they can use previous experiences to think about what might happen. I am also taking a Science Methods course which has me researching the benefits of inquiry-based learning. From the experience I have collected, I have realized that allowing younger students to research and explore a certain topic of interest allows them to take pride in their work and yearn to solve their problem. As the teacher, you can either provide the students with a broad topic and have them choose a specific topic within the topic, or have them explore anything they are interested in and create something from the topic. From this type of experience, you, as the teacher, can incorporate math, reading and writing, technology skills, and of course meet NGSS science standards. This type of learning is so beneficial both for your students and yourself as your students can explore what they love, and you can discover what your students' strengths and weaknesses are. I believe inquiry-based learning is great. It gives students the opportunity to develop stronger relationships with their classmates, improves their communication skills, and increases their confidence they have in their own ideas and their ability to help the group. Inquiry-based learning is beneficial because it put the student's questions, observations and ideas at the center of their own learning experience. These components will help inquiry-based learning in the classroom: external support, educator guidance and support, understanding of audience, open-mindedness and spontaneity. Inquiry based learning is benifical for all grade levels. With the lower elementary kiddos I would not let them do so much on their own but have it be more teacher directed. Ask them some open ended questions that they can find the answer to. Don't make the questions to hard but enough to provoke thinking. It is also important that you provide them with all the materials that they need to answer those questions. For young kids I find it beneficial that they do many hands on acitivites, they learn the most that way. It also keeps them engaged in the lesson so they are constantly learning as well. Inquiry-based learning helps students critically think about experiments and question the whys and allow for further questions to come up within lessons. I like the incorporation of POE charts (Predict, Observe, Evidence). Students make a prediction and then go on to compare those predications to what was observed. From here, they are able to compare and ask questions as to why things were happening. Then they can make additions to experiements to change results a bit and make even more predictions from them. Inquiry-based learning is something I will have in my future classroom because I've only experienced positive things from it. And the learning that occurd during that time went beyond what I beleive I would typically have. Hi Kevin! I am currently taking a undergraduate course called "Methods of Teaching Science" and we also have a major focus on inquiry-based learning. Personally, I believe that inquiry-based learning is great for students because it gives them a chance to think for themselves instead of merely being told an answer. Furthermore, science is an ongoing investigation of the natural world so even professional scientists are in a continual process of reviewing and asking questions. One way to incorporate this type of learning is to follow the 5E model (Engage, Explore, Explain, Elaborate, Evaluate) which easily aligns with Next Generation Science Standards. I suggest becoming familiar with both of these, if you are not already! I cannot think of any cons of introducing inquiry-based learning to lower elementary grades. Journal Article that addresses your question: https://learningcenter.nsta.org/resource/default.aspx?id=10.2505%2f4%2fsc17_055_01_18 I hope some of this is useful to you! Hello Brooke, I like your inclusion of the 5E into Inquiry Based Learning. I agree with you because it is an opportunity for students to engage in activities that increases their metacognitive skills, which promotes higher order thinking. Through this method of learning in science, students can learn by investigating, exploring that creates discussions to the curious young mind. I support your article Brooke. The five E model (Engage, Explore, Explain, Elaborate, Evaluate) has been emphasized in a plethera of my courses, especially classes with field experience. I have experienced great success when using the five E model as it helps both the teacher and students better prepare and execute lessons. Great read! Brooke, I couldn't agree more with your explination and further contribution to how and why inquiry is important for students within the classroom. I also think that on top of that, inquiry based learning provides the educator with the opportunity to plan and consider all areas of science before connections are made within the classroom. This plays a valuable roll because it then prepares the educator for whatever could happen within the classroom. I also believe that it recognizes and establishes the importance of using others, resources, journals, and previous scientists findings and knowledge to gain a deeper understanding of the natural world around us. This is why the Next Generation Science standards play a vital roll in following the 5E lesson plan model as well as P.O.E. (predict, observe, explain) and C.E.R. (claims, evidence, resoning) within the science classroom. On the Teach Channel website there is a framework called KLEWS. This is a type of strategy that allows students to connect in inquiry-based learning through the C.E.R. model of investigation. I have attached the link to this website below. Overall, I truly believe in the importance of integrating inquiry based learning within the classroom, but believe this cam be done is so many ways like KLEWS and C.R.E. As an undergraduate student, I completely agree with becoming familiar with the 5E Lesson Plan format. I do understand how to write a 5E; however, I am still working to strengthen them. Thank you for the information! Hi Kevin! Like many of the others replying to your post, I am also a big fan of Inquiry Based Learning. I am an undergraduate student studying elementary education, and I did a project that included inquiry based learning. Based on the research I did for this project, students learn well when they are a part of finding an answer to a question. One of my college science classes was largely centered around inquiry based learning. I felt like I was learning so much more because I was actually a part of my learning! It also ended up being a lot of fun, which is really great because it will help get your students more interested in science! I'm currently a junior at the University of Northern Iowa and also majoring in Elementary Education just as you are. As I was scrolling through some of the comments, something in your reply to Kevin really caught my eye. You stated, "One of my college science classes was largely centered around inquiry based learning. I felt like I was learning so much more because I was actually a part of my learning." That's my absolute favorite thing about inquiry-based learning! Students can actually get their hands dirty and become immersed in the wonders of science. Instead of the teacher doing all the talking, the students can be little scientists and become the ones in charge. As we've been carrying out investigations in my own college science class, we've really been focusing on the framework of Predict, Observe, and Explain as well as Claim, Evidence, and Reasoning. Although we have the convenience of class iPads to record all of this in our science journals electronically, elementary students could so easily record their own science findings in a simple notebook. It's so awesome that they can keep track of their own scientific discoveries from the time of their very first prediction, all the way to their final claim, along with reasoning to back up their evidence. How does inquiry-based science help students? How does a teacher know if he/she is successfully teaching science using an inquiry-based approach? Does inquiry-based science look different in a lower-elementary classroom than in a middle-school classroom? What are some common misconceptions that teachers have regarding inquiry-based science? Tera- I believe that inquiry-based learning is beneficial for all grade levels. I too think that incorporating inquiry into your science teaching comes in variations. We know that their are different kinds of inquiry (confirmation, structured, guided and open) as you stated above, and I think finding the right kind of inquiry for your specific class is essential for engaging your students and teaching science effectively. In most situations higher level students, should and will be able to do open inquiry often. They should be able to generate questions and design and conduct their own investigations. But, I do agree that for younger students like K-2 this might not always be the case, and that’s okay because they are in the beginning stages of inquiry-based learning. And in these grades we are building the foundation for being able to engage in full open inquiry. So with the younger student’s in our classes we can assess their abilities and what our goals are for a particular lesson, and decide what kind of inquiry is best in that situation. For younger student’s I would say that guided inquiry is a really great place to be because it involves more direction from the teacher. The teacher usually presents the students with the question to be investigated, but then the students have control of how they want to conduct the investigation. An example of guided inquiry that I have recently done in my science methods class was with soda cans of diet and regular coke. The professor gave us the question that needed to be answered (“why does one sink and the other float?”) and as small groups we were able to plan and conduct an investigation to help us understand the phenomena. But, our professor would check our plans so she could give us feedback, and make sure we were on the right track. This activity is great because it allows the students to have more control over their learning, but not full control where the learning goal of the lesson is lost in the process. Brianna, I am an Undergraduate studying Elementary Education and I agree with you that inquiry-based learning should increase for students as they get older and once into those upper grades, there should be large amounts of open inquiry. However, I do not believe you have to limit your k-2 students to only guided-inquiry. Little kids are curious and have tons of questions about the world around them. I think if we don't give our K-2 students also a chance to openly inquire about the world, they will struggle when they get to upper grades in which open inquiry is prevalent. It is important as you stated to start off with teacher direction through structured and guided-inquiry, but also help students through open inquiry in which they perhaps have more control over the lesson. They may surprise you with what they learn and come up with! In one of my college courses, I had the privilege of teaching a unit on engineering to a small group of second graders. To start the unit, we simply gave students blocks and had they make a marble roll. They did this however they wanted, and soon developed problems that they encountered and wrote down how they fixed them. I think this type of open inquiry allowed students to have fun and really go where they wanted to with the lesson. Student's still learned about problem-solving and Engineering but it was more student controlled! Brianna- I love all of the information you have here! It's great to know about each stage of inquiry and how there are different levels of meaningful learning that comes from each. In the Elementary School Science Methods class it has been helpful seeing examples of each kind of inquiry in various experiments and being able to reflect on the kinds of experiences we have seen in the field. Like Megan, I once worked with 2nd grade students on an Engineering unit, and although my students were some of the lowest in reading levels, they excelled and had fun working on the science unit. They were able to use open inquiry to explore the materials presented to them and I watched as they defined their own problems and experimented on ways to solve them. This shows that even students who are considered to be below grade level on one subject area can excel in investigations that involve open inquiry, and just like you said, starting the students in these processes at a younger age can benefit their scientific thinking later on! Jamie, that is amazing to hear how the students you worked with who may not have been good in other subjects or considered to be below grade level are excelling at inquiry-based learning. I am a student majoring in Early Childhood Education and am currently learning more about using inquiry-based learning. I would agree that it is beneficial to start using inquiry-based learning at a younger age. In each grade the students are using the knowledge they gain from the year before. Like having your foundation and building from that. Megan- I really like what you talked about and agree with you when you say younger students should be engaged through open inquiry. I also agree that teacher directed learning is appropriate at the beginning but it is very important to get students learning on their own and figuring ideas out themselves. Especially with science, this gets them creating their own questions and predictions, potentially getting hands on experiences, and opportunities to solve problems and develop explanations on their own. These methods can be very beneficial for students because I, myself, learn best and am fully engaged in my learning when I can have some sort of control. I also enjoyed reading your experience of teaching an engineering unit. I work at a daycare and most days I am just shocked at how smart those kids really are at such a young age. I find myself learning from them as well, which also shows another benefit to inquiry-based learning. If I, a 20-year-old, can be learning things from children at the ages between 5 and 10, these children can be learning from each other instead of having one person (teacher) show every student how to learn. Every mind is different and these differences should be shown and used in the classroom. Not only will this improve one's learning of content, but these ideas will improve skills such as problem-solving and critical thinking which will be very beneficial as students progress in their education. I am currently taking Elementary School Science, as an undergraduate at UNI. I believe that using inquiry based learning is very beneficial in the elementary age group! There are so many benefits to including the steps as well as modifying them to being more teacher involved to more student involved as well. When students are involved in this it allows them to engage in learning that develops problem solving abilities as well as critical thinking skills. They learn to use these working with science but these are skills that will translate to their life. Now looking toward you creating the lessons you explore things that you encounter everyday in life, with this it will also increase the engagement of your students since it will relate to them more and create background knowledge. So over all I think that it is important and I hope that this helps answer some of your questions. Inquiry-based learning can be very beneficial in not only the upper elementary grades but grades like K-2nd as well. Inquiry based learning is very beneficial because the teacher provides the students with the necessary skills and knowledge to be successful when they are able to choose their own topics of inquiry. They're a lot of great ways for incorporating this type of learning in the classroom. Inquiry based learning is very important to use often at the beginning of the year. Modeling good inquiry and developing a sort of routine will greatly help students when they are doing their free inquiry and are on their own. Another wonderful thing about inquiry based learning is that children can grow off of the teachers inquiries and make the activities their own. They're able to develop their own questions and experiments based off of their interests related to the teachers inquiry. This is a great way to get students engaged and involved in their learning. Inquiry based learning is a great way to foster children's learning when done correctly and something I will use in my future science class. Hi Gabe! I am currently studying elementary education and am taking a class where we are talking quite a bit about inquiry based learning. I would agree with you that it is really important to teach even our youngest students through inquiry based science. Young kids are particularly great at wondering about the world in which we live, so I think that allowing them to question and figure out why things are the way they are at a young age is really important. I did not grow up with much inquiry base science education, and I can see how that has affected me as a young adult! I like to know the answers, but the work of science (and life) can be messy and complex. Teaching students how to think critically and try to make sense of the world cannot start too young! Additionally, I agree that guided questions can be helpful, especially at the younger ages. I was working in a first grade classroom, and the students were studying seeds and plants. The teacher would ask students for predictions, but she was cautious to not tell the students too much information. The students were in charge of observing, thinking, and making sense of the plants. I also think an important aspect of inquiry based science is having the students see and explain the evidence they have found. I think that this, too, can be cautiously guided so students are reminded to be thinking about why they are making the claims they are. Teaching science through inquiry gives students the opportunity to make learning their own. Students are more likely to understand and gain knowldge through their own thinking and curiosity. Students are always asking questions and are curious about their surroundings. Through inquiry lessons, teachers are able to facilitate the students learning by providing them resources to explore and having them answer questions based of their own knowldge and experiences. Science is a subject that has many misconceptions that can also be uncovered through inquiry based lesson. Students thinking during the exploration part can give teachers insight to any misconceptions students may have before the Explanation occurs. Students have to be provided with supported and researched answers so they are better informed for future science classes and life. Exploration in inquiry based lesson, gives students the opportunity to act on their questions and observations. Students become engaged in their learning when they are able to do hands on activities that are fun. They come up with more questions when they explore which expands their knowledge. This helps them to think critically about their learning throughout all their classes. I agree with you that students are always aking questions and are curious about their surroundings. Without asking questions and being curious, learning would not be fun! And that is when inquiry based learning is a great form of instruction for elementary students. They are able to investigate and answer questions themselves. Throughout my gradeschool, I was not the biggest fan of science because I was constantly given step by step instructions on how to do a lab or experiment and we were required to follow those steps. However, many times my group members and I would get confused with the steps resulting in none of us knowing what to do. Inquiry based learning allows for like you said, the opportunity for students to explore on their on- to act on their questions and observations. This results in a higher order of thinking for students and a more fun and engaging activity. Inquiry based learning gives students hands onlearning and real life examples. The youtube video I have attached below takes you through an interesting perspective that I had never thought about while watching Harry Potter. It also then takes you through inquiry based learning and the advantages of it. It is a short, interesting video to watch if you have time! Enjoy! I have been learning about Inquiry-based learning and it's very beneficial for students. It allows students to take action towards their learning. They have an opportunity to be engaged in a topic as they make predictions, they analyze different things, participate actively in hands-on activities, and then can make reasonings and conclusions. This learning helps the teacher to see what students know and how they learn. Then, the teacher will be a guide and can then expand the students' learning. As other people mentioned here, this helps students learn a concept better as they just won't be reading about a topic but instead they will actually have the whole experience and interact with peers as they investigate. The 5E lesson format allowed me to understand the inquiry-based learning and I have taught a lesson to students this way and they really enjoyed it as well as I felt confident being their guide and the outcome was successful. I agree with you that inquiry-based learning is very beneficial for students as it allows students to take responsibility when it comes to their own learning. Inquiry-based learning teaches children how to collaboratively work with other students, as it encourages students to share their ideas while engaging in critical problem solving processes. Inquiry-based learning is centered around the student, while the teacher is there if guidance is needed. An example that shows inquiry-based learning is that a teacher might present an open-ended question such as, "Will the pop can sink or float if I put it in this tub of water?" Students will be able to make a prediction of what they think will happen and share their predictions with their classmates explaining their thought process. Students will then be able to formulate questions such as how can we find out? Because it is student driven, they are the ones who investigate and try to find answers by finding evidence to lead them to an explanation. I love the idea of inquiry-based learning as I feel like students in Elementary School could benefit from it as it builds students curiousity as they want to find out answers, while increasing their motivation and critical thinking skills. Hi Kevin, I am a Junior in FIU and i am majoring in Elementary Education and i have to agree with everyone else. Its important to Guide the questions, even in an inquiry based lesson regardless of grade level because this strategy will ensure that your students are maintaining interest and focus in the lesson. Following the 5E's is a very good and highly effective guideline to follow when it comes to facilitating an inquiry lesson. every aspect of the cycle serves an individual purpose that cumulatively enhances the overall quality of the lesson. I have personally written lesson plans using this concept and have was able to understand the inquiry idea much better while doing so, it also reminds you that an inquiry lesson is about student engagement and independent/higher thinking. Inquiry based lessons are beneficial in a variety of ways. Inquiry based lessons have to do with teach guiding and facilitating rather than spoon feeding information to students are having students sit, listen to a lecture, read a textbook and write notes. Not only will the students be engaged in activities through inquiry based lessons but they will have more of an understanding because they are the ones who are investigating, observing and questioning the science lesson. The work and participation that students have to give in an inquiry lesson makes the students more engaged and leads to better learning outcomes and better understanding of the science topic. I definitely agree with you that inquiry based learning is extremely beneficial to all learners. This type of teaching allows for students to become involved in their learning and to contribute their ideas to the whole class. There are four different levels of inquiry that students can be engaged in. The first level would be confirmation lab or cookbook lab. In this lab everything possible is given to the students and the students follow the steps given and get the same results. This is the lowest level of student inquiry. The next level is structured or directed inquiry. This is where the teacher will give the students the topic/question they are to answer and the procedure and materials they are to use. This differs from comfirmation labs because the students will come up with their own explanations of the results. Then there is Guided Inquiry. In this inquiry the teacher only poses the question the students need to answer. How they conduct the experiment and how they explain their results is up to the students. The highest level of inquiry is Open Inquiry. This is where the students create all steps of the experiment, from the question to the answer. This is the level that we want students to end up at, but when using inquiry based learning for lower grades (k-2), it is important to realize they are not going to be able to jump right into Open Inquiry. We must build their knowledge of creating experiments and work together with them to grow their knowledge on how to create experiments. This will result in more critical thinking, and the students will be able to dive deeper into developing Science and Engineering Practices, Crosscutting Concepts, and Disciplinary Core Ideas. CLICK HERE for ideas on how to successfully implement Inquiry Based Learning into the classroom. Hi Kevin! I am currently a student at the University of Northern Iowa. I am studying Early Childhood Education with a minor in Special Education. Recently, in my Teaching Elementary School Science class, I have been learning about inquiry based learning. We are learning different ways on how to incorporate into our lessons. The best part is- other subjects are using it as well! Another class of mine have touched on the topic of the 5 E’s: (E) laborate, (E)ngage, (E)xplore, (E)xplain, (E) xtend. As most of the others have replied, inquiry based learning can be very useful within the different grade levels. Specifically, I really enjoyed Keaton Despards post! She stated, “During this phase the teacher, you, needs to keep their hands out! You want the students to define the problem/phenomenon in their own words.” I feel this is very important to remember! Sometimes students may take longer than we are hoping for but that can be when some of the best ideas come about. It is important to remember that we give our students enough time to think and communicate with one another their ideas. In my opinion, the different types of inquiry based learning make me excited to become a teacher. There are many helpful hints when it comes to the different types of inquiry based learning! We did a science experience in the classroom, recently, that was called the “Soda-Can Experiment”. This was a guided inquiry based learning because the teacher came up with the initial question. “Will the soda can float?” The students were then to think on whether it would float or sink and to come up with a reason why. It was a fun experiment that got us all thinking and involved! I am currently an undergraduate at the University of Northern Iowa, and I am taking the class on methods of teaching elementary school science, and we are currently focusing on inquiry based learning for our students. It is highly researched that inquiry based learning is much more meaningful to the students, as well as the teachers. Inquiry-based science instruction is hands-on and engaging allowing students to become highly motivated for learning science. One way that you can use inquiry based instruction is to pose a question to your students and allow them to do the investigations and to find the different explanations throughout their experiments. I think that it is important for students to be able to keep track of their information and be able to communicate their information. One way students could do this is through the P-O-E model of inquiry-based science. The P stands for their prediction. The first need to predict what they think is going to happen. They then can move on to the O which means to observe. This is where they would write down all of their observations, and what they have noticed throughout the experiment. They would then go to the E which stands for Evidence. This is where they would justify their observation and why things happened the way they did in their experiment. This might include having the students do some research, and collaboration. Collaboration is key when talking about inquiry-based science instruction. Inquiry-based science instruction is extremley important in the classroom, and is one influential way of teaching your science materials. Inquiry practices often involve more student-centered activities where students interact more intensively with materials and with other students during investigations. In addition to monitoring the learning taking place, teachers in an inquiry classroom have to manage more movements of materials and equipment and the social dynamics among students. In this article, the authors share seven successful strategies one teacher used in managing a grade 6 class that gave her confidence in transitioning from a traditional classroom to a more inquiry-based classroom. I hope this information helped! Best of luck! I am an undergraduate currently taking Elementary Education Science Methods. I believe that using inquiry based learning in science is a way to engage the students while also letting them think for themselves. The inquiry learning can vary from how much the teacher directs the learning. This can range from laying out the instructions for every part, such as the problem, procedures, and results, to having the student create all of this. Confirmation lab, structured inquiry, guided inquiry, and open inquiry is the progression the students will make from teacher led to student led inquiry. Implementing inquiry based learning at first can be difficult, especially if the teacher and the students have never done it before. It takes time to get used to each level of inquiry, but is a great way for students to learn and be able to understand their thought process. When deciding what inquiry to choose make sure to focus on the age and development the students are at. Working up the inquiry scale may take time but is well worth it! One thing that we have recently learned about in our science course is using the KLEWS chart. This really helps students focus on what they should be learning. K- What do you think you know? Having students access their prior knowledge makes it easier for them to make connections. L- What are we learning? This is where you put the focus question and being specific is important. E- What is the evidence? Students should be looking for evidence that relates to the question. W- What are you wondering about? Students may still be confused about certain concepts or what they saw. Giving them a place to write it out lets them be able to come back to it and see if they were able to figure it out or if they need to ask a question. S- Scientific words and concepts. This is where students or a class can create their own definition to help them discover new words. I have enjoyed learning about this chart as well as inquiry based learning and truly believe that all students will be engaged and can succeed using these materials. Sam- I really liked how you discussed the KLEWS chart and its benefits. I agree with eveything that you have discussed about it, and would like to take it a step further even! I think that it is important to note that the KLEWS chart is not supposed to be done in any specific order like the KWL chart. It is meant to be a fluid chart where you can write things down in any category at any time. I think that this is important to note, because it lets students know that it is okay to go back and write down more things or skip ahead and define concepts. That is something that I really like about the KLEWS chart that makes me want to implement it in my future classroom. I also agree with yourstatement about how implementing inquiry based learning can be difficult at first. It seems like it is a daunting task, especially for new teachers. I think that once you get one inquiry based lesson under your belt though, it will become much more natural. I also think that it is very important to note that none of the various levels of inquiry are bad in any way, they each just have different purposes. Of course open inquiry is the ultimate goal and can really enhance student learning and understanding, but I think it is important to understand that open inquiry might not always be possible. There are going to be some lessons that will have to be more teacher directed for various reasons. By knowing the value of each level of inquiry teachers can truly be successful when implementing inquiry based learning in their science classroom. Kevin. What a great conversation you have started and from reading the many prior posts I can't help but to believe you are swayed into the many benifits of what this inquiry based learning can do for your young students. I agree with many people prior on guiding the questions with your younger students, even at a fifth grade level, kids can get off task. By you guiding them, it usually offers more of an opportunity for them to learn what you were intending. I found this article on guiding teacher for inquiry based learning and how to prepare efeectively etc. If you get the chance, look it over; it gives several tips and ideas on how to make it the most effective lesson. Inquiry Based Learning Guide for Teachers All the luck! I am a senior at the University of Northern Iowa. This semester I am taking my methods of science class. We are currently discussing inqury nased learning. I truly think that this is beneficial for the younger elementary grades. If you think about teaching in a Kindergarten classroom, children love to be active and always want to be moving. Therefore using inqury is great. The best type of inqury for this age I think would be guided inqury. Where you allow them to run through the procedure. It would be a great idea to start with a teacher lead example and then let them test things on their own. This gets them thinking about different things at a young age. The skills that you are allowing them to attain throughout this inquriy will help your students tremendously throughout their schooling. One thing I would recommend is allow for questions, allow for students to test things but make sure that they are fully understanding at the same time! I am in a science methods course as well and I am finishing up my undergraduate studying Elementary Education. I believe inquiry-based learning is one of the best ways for students to learn in a science classroom. Having the inquiry-based instructions allows students to dig deeper into the science content and explore different solutions and processes to those solution. In science, I believe the process of solving a problem is better than the outcome of the problem itself. When students are getting hands on experience when doing and learning science concepts, it will become more meaningful to them and will help them develop a deeper understanding to the critical thinking process. I am a undergraduate student at University of Northern Iowa and currently taking a science method course right now! One of the major topics we have discussed is inquiry-based learning within our classroom and how to incorporate it. This type of learning is very effective and beneficial with a variety of ways to put it into use in your classroom, espicially for younger grades. It allows your students to make observations, ask questions throughout their learning, and analyze their data they found. For example, in my class we are trying to figure out why some fruits float while others do not. During our investigation we were doing all those things I previously listed as well as coming up with different explanations from our evidence we gathered. This also lead many of us during this time to communicate as a bigger group and whole class to justify why we believe what we do. Although this may seem like only older students can do this, younger elementary students can still engage in inquiry based-learning. A few ways you could do it is to have a guided or directed inquiry-based learning environment for them. This is where you will help your students get started and give them help throughout their investigations while still giving them the opportunity to do some of it on their own. During their investigations you could a P-O-E (predict, observe, and explain) or a C-E-R (claims, evidence, and reasoning) as some other people have already talked about as well. This would be a great idea for your students to be engaged in their own learning of science while still getting the support they need at a lower grade. I am taking a methods of science course this semester as well, and we have been learning most of our content within the category of 'inquiry-based learning'. This week we've been working on replacing KWL (Know, Want to know, and Learned) with a longer version based primarily for science, which is KLEWS (what we think we Know, what are we Learning, what is your Evidence, what are we still Wondering, and how is it Scientific) and how CER (Claim, Evidence, reasoning) fits into it. I know, it's a lot of acronyms. But I'm very happy we're learning about them because KLEWS may just become my favorite type of lesson plan. Whether that's because it's ACTUALLY more concise and understandable or if it's just the fact that I'm in my last year of school and have a lot of prior knowledge, I couldn't tell you. KLEWS sets itself up as an inquiry-based kind of lesson with the first and second acronyms- What we think we know and what we're learning. it starts off giving the kids the agency to make their own claims and hypotheses. The E in the acronym might be the most important as rather than simply giving the kids the answer and expecting them to memorize it, we let the kids come to their own conclusions about what their particular evidence means. Inquiry based learning is about putting learning squarely in the students hands and letting them learn by doing. Lectures are out, learning is in! Very good stuff! I enjoy it all! Inquiry based learning is a teaching strategy that I am effectively learning about in my current course. It is a great strategy that I plan to use in my future classroom. Students are engaged, understanding and taking ownership of their learning. What is important to always have included in an inquiry based lesson plan? I am an undergraduate student at the University of Northern Iowa. I am taking a class right now about teaching elementary level science and we have talked a lot about inquiry-based learning. Even though I have never really been into science having an inquiry-based lesson makes science interesting to even though students! In class, we have been doing an ongoing inquiry-based experiment about different objects that float. It is very intriguing and even keeps a whole class of college students on our toes and interested! I think inquiry-based lessons are awesome ways to incorporate science into an elementary class because sometimes it is hard to keep young children's attention. When you are doing something that is hands-on and the children get to lead it and feel like they are the ones doing it they will be more likely to want to be involved and learn. When I was in elementary school the science classes I remember where mostly lead only by the teacher, and maybe that is a big reason why I never became interested in science. I found a really good video that talks about using inquiry-based learning to transfer your class from teacher-guided to student-driven. Check it out below! I am currently an undergraduate student at the University of Northern Iowa, where I am studying elementary education. I am in an elementary science methods course where we are learning about inquiry based learning. Inquiry based learning can be very beneficial and extremely effective for early elementary students if the teacher implements with fidelity. Questioning and guiding students through their learning will be important for students. Inquiry based learning cannot be a free for all for students, but a guided learning experience. Students are by nature curious and want to have their hands on learning tools as well as learn through actual experiences of their own. I believe that inquiry based learning would be engaging for early elementary students. When using inquiry based learning in your classroom you can control the amount of guidance you give your students. Do you want to give them specific questions? Would you like to have your students start with their own questions? There is a large range of guidance in inquiry based learning. As an educator that is new to inquiry based learning, it can be difficult, but understand that the benefits of inquiry based learning are worth the time and effort. I agree that inquiry is beneficial for all students. They do get that chance to experiance things on their own and come up with their own questions and connect them to their own lives. I am currently obtaining my Elementary Education degree from the University of Northern Iowa and am taking a course on teaching Elementary Science. Lately we have been focusing on inquiry based learning and how it would look like in a typical elementary classroom. As this is a newer concept for me, it has been rather interesting to learn and participate in inquiry based learning. The past couple of classes we have been focusing on items that float in a tub of water and our predictions as to why things are floating and not floating. Some of the objects we have been experimenting with have left some of us wondering “Why? !” at the end of each class. As an advocate that children need to learn through play, I feel like inquiry based learning branches off in a way so older children are able to learn yet still be manipulating. Inquiry based lessons keep children thinking, wondering, and keep children’s attention and interest. While children are able to ask questions and do the experiment, they are going to be more likely to remember this in the future because the teacher wasn’t just lecturing to them about the topic. As an student in my younger years I remember doing science experiments and being some-what interested in them, I specifically remember doing an experiment with celery and how water travels through them, but also remember the teacher doing more talking than allowing us to really think about how and why water travels through celery. I feel that if I was able to be engaged in inquiry based lessons through my younger years, I would be more interested in science. This is all new for me too and I am learning so much! I do love it because it is always engaging, challenging, and uses critical thinking. Inquiry based learning is something I plan on incorporating in my classroom because I feel that every student will benefit from it as well. I am an undergraduate student at University of Northern Iowa majoring in Elementary Education. I am in a science methods course now but have taught science to 2nd and 6th grade students during different field experiences. I’ve found that inquiry-based learning is beneficial through both of those grades. I think it’s very beneficial for the younger students because what I’ve noticed is doing hands on work with them helps them understand and investigate problems on a more attainable level. Inquiry lessons allow students to wonder more, which inturn can extend the inquiry process allowing students to learn more. Some ideas for incorporating this kind of learning would be doing things like wonder walls, this definitley helps students because whenever they have questions they can put it on the wall without disrupting the class. KWL charts are also effective in inquiry-based learning. I am a student at the University of Northern Iowa studying Elementary Education and Educational Technology. I am currently enrolled in a science methods course reviewing inquiry-based learning and how it can be used in the classroom. We've been modeling it out in class with our own experiment, breaking the inquiry levels step-by-step. This breakdown of inquiry, starting from the first observation to the knowledge they've learned, can be beneficial for elementary students in the classroom. Students at this age learn best through play and hands-on activities that allow them to be cognitively involved. I think that having students take control of what they want to test out allows for a more memorable learning experience, which allows them to easily pull knowledge from memory. Hi Kevin, I am currently learning alot about inquiry based learning and I love it for many reasons. I love that it gives students the hands-on approach to science as well as giving the students a chance to come up with the questions and answers. Children have so many more questions and more ideas than a standard curriculum can provide. Giving the students that open area to come up with questions and follow through with investigations provides more learning and understanding for the students. I plan to teach the middle level grades and I plan to incorporate a guided inquiry approach. I think at this age students will still need guidence during the investigation process but also need materials and time to come up with their own thoughts. Inquiry is a time for students to work together, problem solve, and build relationships. Inquiry based learning provides challanges for students of all ages and abilities. Using inquiry in the classroom is also a way to help with differentiation in the classroom. Students come in with all different abilities and previous knowledge so putting the students in charge helps to bring all these differences together and bring out more learning. Inquiry is beneficial to most classes at the education level. However, when it comes to science, there's a different dynamic to inquiry because it's a method of discovery that comes from interaction and visualzation in exploration of newly discovered ideas. In summary, I can't imagine a science class or even lesson where I, as a student would do nothing but listen.I'm currently an undergraduate student that is enrolled in teaching elementary science which is fully supports inquiry through the means of curriculum and various methods. Two methods that come to mind that can be implemented are the various ways to guide students in an investigation or problem solving through the use of necessary prompting. Utilizing P-O-E (Predict, Observe, and Explain) allows the students to recall on what they think they know in regards to what is being targeted. Students will then observe what is happening or record data to support their initial claim, or to find evidence that would suggest otherwise. Lastly, explain helps students analyze evidence to determine if their claim was essential after the experiment/ presentation. Another method of inquiry to use in problem solving/ experimentation would be K-L-E-W-S (What do we know?, what are we learning?, What is our evidence?, What do we still wonder about?, and What scientific principles/ vocabulary help explain the phenomena?). The main idea to pull from these two inquiry structures would be that students could participate as a whole class or in groups in order to establish their own individual belief or opinion. I think, in essence, this what we aim to achieve in inquiry. We want students to learn science for themselves while collaborating with others and being more hands on with the task at hand. Inquiry based learning, I believe, is important because it gives students the hands on experience and really emerges them into what they are learning. It helps students understand more about what they are supposed to be learning. However, as teachers and even students have to be very clear over what they are trying to find/understand through inquiry. When I was younger I would do a lot of science projects and inquiry in my classes, but a lot of the time it wasn't clear to me what I was supposed to be finding. It was more clear when I came up with the question when our projects were student-lead because I was the one coming up with the question. That is why I think it is important to make the K-L-E-W-S model visable and have our students use it to help them better understand what is going on. Hi Kevin! I am an undergraduate at UNI taking a course on the Methods of Teaching Science. We have learned a lot about inquiry-based instruction and the different levels of inquiry. Open inquiry happens when the students are proposing the questions procedures and results. During this level of inquiry, the teacher is more hands off, letting the students explore. The next level is guided inquiry where the teacher provides the question but the students use the question to create procedures and results. Structured inquiry is where the teacher provides the question, and the procedures and the student just provides the results. All of these levels of inquiry allow the students to do different things that benefit their learning. Inquiry based learning is multidimensional. This is why I believe inquiry-based learning is so important. I like this picture I have attached becasue it goes into the idea of multidimensionality. Like many of those to respond to your post, I am an undergraduate at UNI in a Methods of Teaching Science course. To respond to your first question, Inquiry-based instruction is helpful for all students, even in lower elementary. The paper Motivation for Learning Science in Kindergarten: Is There a Gender Gap and Does Integrated Inquiry and Literacy Instruction Make a Difference which was published in the Journal of Research in Science Teaching in 2009 provides strong support for including science in a younger child's regular school experience. They found that inclusion at a young age help students to feel more confident in their ability to learn science and made students more interested in science (especially girls). As for different ways to incorporate science into these grades, you can look at the Next Generation Science Standards and the standards for the state in which you teach. Hello! My name is Kristi Pasker and I currently am an undergrad at the University of Northern Iowa studying elementary education with a special edcuation strat I minor. I am currently in sience methods course for elementary teaching to which we are discussing and learning about inquiry based learning. Inquiry based learning is so beneficial for students as it deepens their thought process, enhances engagment, and allows the students to make predictions, analyze data, and work collaboratively based on the evidence they have obtained and their reasoning behind it. These discussions promote collaboration and allows them to go above and beyond the typical way thinking about things and why or why not things occur. Inquiry based is pretty student based and students led with the help of the teacher when needed. I find this to be helpful because the students are forced to think for themselves instead of being told what to think. They are able to enhance their problems solving skills, and obtain a more meaningful understanding of how and why the world or things within the scientific world work or don't work. Hello Kevin, I am a current undergraduate at the University of Northern Iowa with a major in Elementary and Middle Level Education. I am currently taking an Elementary Science Method course and we have been discussing a lot about inquiry-based learning. Throughout the first few weeks I have learned a lot about inquiry-based learning and feel that it is very important for students to partake in. I have learned that there are many different levels of inquiry-based learning ranging from confirmation lab to open inquiry. Inquiry-based learning is crucial in lower elementary because it helps students think critically and learn how to create questions and investigations on their own. This will create lifelong scientists. It is important to introduce this kind of learning in lower elementary because then students will be able to grow and get even better at it as they get older. As students get older they will be able to praticipate in even deeper inquiry. In lower grades teachers need to be more of a facilitator than in older grades. For example, in younger grades teachers might need to provide the question and maybe the investigation, but as students get older they will learn to do this on their own. Overall, inquiry-based learning is important because students are actually "doing" science, rather than just being given vocabulary and then given a confirmation lab. Hey Kevin, In my sceince methods class, that I am currently enrolled in at the University of Northern Iowa, we have been taking a took at the idea of iquiry based science. In the short tiem that I have been looking in ti this topic I have found that it has a value at all ages. Think about it as a different question. Do you want your kids to question the wrold around them and give them the tools on how to go about awesering those questions. In lower elementary it is important to let kids explore they are willing to ask questions that push event he teacher to think harder about the topic at hand. I feel that it is benefical to have in the lower grades. I feel that students who are well engaged in inquiry-based learning perform better on standardised tests than students who are more in a tradtional classroom learning enviornment. They engage in meaningful work that is worthy of their time and attention. There are some steps into inquiry based learning, ask questions, probe into various situations, conduct analysis and provide descriptions, communicate findings and think about the information and knowledge that was obtained while doing this experiment. Open inquiry is where learners must form their own questions, design investigative methods, and then carry out the inquiry itself. They must present their results at the end of the process. Such as why does an object sink or float? The children are also able to dig deeper into the concpts by letting them eplore and understand the process. Allow students to test questions but make sure they are understanding what they are testing over and doing. As some of my other classmates have explain that the KLEWS chart and how it is beneficial to all students. They are not made to be done in any kind of order like the KWL charts, but you are able to write down things in any category. Inquiry based learning is kind of hard at first but once you get the hang of it it is pretty simple to work with. I agree that in lower grades children are always wanting to move and having them move around is good, guided inquiry for lower grades is probably what is appropriate where they ae able to work through the procedure. Kevin, I believe that inquiry based learning in elementary schools would be very beneficial. I think a guided-inquiry would be best for students in grades K-2. The teacher provides the students with the topic and main question, but students are still able to be involved and have some control over their learning/experimenting. Students in younger grades are very energetic and active, therefore, I believe this inquiry format would fit best from them. This format sets students up for trial and error experiences which is great because students learn best from their mistakes. So, if they make mistakes during their experiments or research they are learning through the whole process giving them a deeper understanding of what they are learning about. Hi Kevin, I am an undergratuate at the University of Northern Iowa and currently talking in my Science Methods course about inquiry based teaching in the classroom. In my class we have talked about the multiple levels of inquiry and I think it is very beneficial to teach and use inquiry in the classroom. To me I think it really gets students involved especially when answering questions and exploring what they might not get to on a typical basis. Something that goes along with inquiry is problem solving. I am currently also taking a problem solving course and think it's so cool when students can dig deeper and branch new questions based off of the original. Without science inquiry I feel as though school wouldn't be as fun to the students because they wouldn't have that opportunity to carry out investigations and use their learning to continue learning. Hey Kevin! Like many of the people replying to your post, I am a student at the University of Northern Iowa aiming for my bachelor's degree in elementary education, and currently enrolled in a Science Methods course rooted in inquiry-based teaching. The largest obstacle to inquiry-based education in a lower-elementary classroom is the necessity of guiding questions. True inquiry-based learning is spontaneous: upon finding new variables and having new ideas, the questions change to fit the new insights. However, with lower elementary students, there might be an issue with not having enough prior knowledge and understandings to be inquisitive in the right ways. Inquiry-based learning plays off natural curiosity of younger students, and it does it well, but the proper questioning techniques must be taught to students through modelling and direct instruction; there is just no way around needing to incorporate some direct instruction especially at earlier ages. This is in no way a critique on inquiry-based learning, however. I fully believe inquiry-based learning is vital in all subjects, and is truly what learning is all about--witnessing an event, questioning why or how the event occurred, experimenting on ways to recreate (or in some cases, prevent) the event, observing the results, and theorizing and questioning again based off the results is essentially all of the experiences one has in their life. Inquiry-based education is the most natural form of learning I can think of, and therefore is vital to teach in all grades. The only pitfall is with younger students is guiding them towards how to properly question, observe, assess, reflect, rinse and repeat, but providing them with those tools for inquiry will set them up well and enhance their own learning in not only science but every school subject and life experience for the future. Hello Kevin! My name is Abby and I am an early childhood and elemetary education major at the University of Northern Iowa and am in my science methods course. Recently we have been working on inquiry-based learning in our classroom. We have been working on whether objects will sink or float. For this lesson we have been lead the experiments based on what we want to get out of the experience. This has been very benefitial because we have based the lesson on what us, as students, want out of it. Plus it enables interaction and it students are more likely to pay attention. Hello Kevin! I am currently a student at the University of Northern Iowa and pursuing a degree in Early Childhood Education with a minor in literacy. I am in favor of inquiry based learning and I think it can be really benefical in an elementary setting. In my science methods class I am taking right now we are learning more and more about what inquiry based learning can look like and what the different levels of inquiry are. There are 4 different kinds, and those include open inquiry and guided inquiry, which are more learner based instruction. Then there is directed inquiry and confirmation lab, which is more teacher based instruction. In most of my science classes, from elementary to high school, I felt like everything we did was either directed inquiry or confirmation lab, which is a lot of the teacher talking and showing the class what to do and not a lot of hands on activity. While confirmation lab is just following a set of directions and everyone ending up with the same result. Niether of these allowed for students to test out ideas they might be curious about and explore topics that are interesting to them. Both of these instructions weren't that fun as a student either. We were just told what to do and then just had to follow the steps. It didn't allow for thought prevoking questions or thinking, and there wasn't much depth to those types of lessons either. I think the more we allow students to come up with questions and ideas they want to learn more about, and then let them explore those ideas and questions with hands on activities, they will ultimately learn more and be excited about what their learning. I think that having students in some way be in charge of their learning will make them want to chose topics they want to know more about, and will also allow for some excitment in the classroom as well, because as a kid who wouldn't be excited about getting to create an experiment about a topic that you were really interested in. I think that inquiry based learning is the way to go for science classes. Hello Kevin! I am currently an undergraduate student at the Univeristy of Northern Iowa and I’m pursuing a degree in Early Childhood Education I believe that inquiry based learning can be very beneficial in elementary schools if taught correctly. It does have the potential to be difficult but with the right curriculum and teacher I think it can be very effective. I wish that’s how I had been taught science at a young age and now science might not be as hard for me to understand. By allowing the students to go deeper into the concepts they are learning. They get to kind of do the learning by themselves. According to the National Academy of Sciences, 1996, Inquiry is a multifaceted activity that involves; making observations, posing questions, examining books and other sources of information to see what is already known, planning and conducting investigations, review what is already known in light of experimental evidence, using tools to analyze, and interpret data, proposing answers, explanations and predictions, and communicating results. There are four levels of inquiry based learning and these levels are, open inquiry, guided inquiry, directed inquiry, and conformation lab. I think it is important to utilize these levels and use inquiry based learning in your science class! Kennedy Carber, that "Dancing Raisins" inquiry-based science lab sounds so interesting! Which professor at UNI (University of Northern Iowa, for members on this thread who might not know) did you have that had you conduct that experiment? I have Dr. Atwood-Blaine as my professor for Teaching Elementary School Science this semester and we did a highly engaging inquiry based lab called “Sink or Float”. In this activity, we tested a variety of objects to see if they would sink or float, using small bins of water at each table. We first started with dropping a can of Coke in, which sank, and then dropping a can of Diet Coke, which floated. The next class, we attempted the same experiment with fruit, the day I found the most fascinating. We discovered odd phenomena, such as how much of a banana makes the fruit sink or float, and what parts of a fruit (peel, pit, actual fruit) sank or floated. In our last class period, we tested this sinking or floating question with everyday objects--like a golf ball, ping pong ball, sponge, penny, and glass bead--and tried to see any correlations to our other findings. These past few days in class have been so exciting to come to, and I am very motivated to figure out the answer to this question. This is the point I wanted to emphasize with Kevin: inquiry-based activities motivate and excite students, even in college, in ways I have never seen when I was in school. Starting your lesson with a phenomenon such as a watermelon floating in water and a grape sinking, grab students’ fascinations, and we'll drive them to know the reasoning behind it. Then, by putting the power into their hands and having them testout the key idea in different situations, rather than just giving them a lecture as to why it happened, gives students so much ownership in their learning. This method of inquiry-based learning, having students feel like scientists (which all of them are!) will help them retain the knowledge, as well as the skills they used to problem-solve their way through the investigation. As you might have noticed the “knowledge" and “skills" are tying in well with the three dimensional learning found in the Next Gen Science Standards about “Core Ideas”, “Practices”, and “Cross Cutting Concepts". Inquiry-based learning and three-dimensional learning work hand in hand and, as we have learned at our university, will bring the most successful learning within our students. Therefore, I would say definitely embrace this new method of teaching inquiry-based lessons! You may need to do a more structured version of inquiry for your younger students, however, when they are at that age, this exploration type of learning is a perfect fit. I would recommend that you start off with either a structured inquiry, which is where you would provide the question/problem and the procedures to the lab, and the students would determine the results, or a guided inquiry, where you pose the question/problem and the students determine the procedures and results. I hope this helps and best of luck in your future endeavors in the classroom! I am currently completing my undergrad at the Univeristy of Northern Iowa. This semester I am taking Teaching Elementary School Science. In this class we are given the opportuity to explore different ways of teaching. We are presented with different tasks and then are allowed to explore differnt meathods of learning. Overall, I have found that inquiry is a useful tool when it comes to science based learning. Being able to question thinking is a huge aspect of science. Looking at the field experiences I have been a part of, I believe inquiry based learning would really benefit younger students. It gives them the chance to work through problems and question their thinkin rather given the tools and data to come to a conclusion. I believe that if it used correctly in the classroom it can be very benefical to students of all ages. I am currently an undergraduate at the University of Northern Iowa. I'm in my last year of school and I'm taking a science methods course. I can tell you that inquiry based science instruction is VERY beneficial for both student and teacher. The inquiry prompts students to come up with their own questions to phenomenan that is happening around them. This type of instruction is more student centered instead of the teacher lecturing to the class for the whole class period. It also gives students a chance to talk with peers and bounce ideas off of each other. The best idea I can give you to incorporate it in the classroom is design lessons to be more focused on students and open ended questions. Don't just simply give out answers. Help them find the answers and probe them with hinting questions so they arrive to their conclusion. It is possible, in my opinion, to have high inquiry in the younger grades you described. You just need to begin the year teaching the steps and procedures of how they should be exploring science in the classroom. I truly think inquiry based science instruction is beneficial for ANY grade level. I am a senior at the University of Northern Iowa. I am in a science methods class right now and we are learning a ton of new things about inquiry-based learning that I didn't know about! I have never been a huge fan of science, but I think it is because I was never taught science the way the NGSS is now having teachers go about teaching science. I think inquiry-based learning is a great way to get children that may not have science as their favorite subject to get involved and become more interested in the subject. Being hands-on and allowing the children to be their own teacher and come up with things on their own is very beneficial. Depending on the age you're teaching you may have to alter the inquiry-based lesson you are doing. Younger students won't be able to think as complex as older students will be able to. You may have to ask more questions to the younger students to get them thinking whereas the old students you may be able to ask one question and they could build off that, explore, and come up with some of their own questions. Inquiry-based learning is great for science but can be used in many subjects! I am currently enrolled in Methods of Science at the University of Northern Iowa. We have been learning about Inquiry-Based leanring this semester. Something things that I have taken away from learning about inquiry based learning is that their are five levels of inquiry based learning. The four levels are all helpful in teaching scinece at lower grade levels. The first level is comfirmation which gives little freedom to the students. The teacher is doing most of the work. Which is okay for the first couple of days but we want to work up to the students doing most of the learning. The second tier is called structure. This tier is where the students are starting to do more of the work but the teacher is still doing a lot of the work for the learning porocess to happen. Tier three is guided. Guided inquiry is where the teacher is less involved. The students get to take charge of their own learning/experiment and really dive into it and learn more about what they want to learn but the teacher is still their "guiding them along" The four tier in the inquiry based learning is open inquiry. Open inquiry is where the students take charge of their learning. They develop the questions, experiments, and everything they want to know comes from their own knowledge and what they have learn thus far. This is where we want to get our students to. We need to have the other three tiers to help guide them to this point. This is good for younger kids becuase they get to start exploring more and learning about what they want to learn about and answering the questions they have about the world and sceince. I think that it might be challenging to get to tier 4 at a kindergarten level but I do think that it is possible and i do believe that students will learn and have fun with it. I think it is very important to start students off with inquiry based learning. Even at the Kindergarten level students can use more teacher guidance for lessons but it is much better than the traditional style of learning. The traditional style of learning really limited how students understood content. Inquiry based learning is taking a different approach that helps students look at learning and science in a completely new way. As educators, our hope is to have all students walk away from the class with a strong understanding of the concepts and I think inquiry based learning is a much better strategy to achieve this. For really young students the teacher would probably have to create the lab or inquiry more for the students to follow but that doesn't mean the students can't use prior knowledge and resources to try and answer the question. I would probably create the question and give them a scenario to possibly solve the question. But I would also give them a lot of different ways to test their ideas. I would like students to come up with their own ideas for why something happens and then try and work together in groups to figure out how to test their ideas. Students can do a lot more beneficial learning when they are thinking and testing and coming to their own conclusion. They are much more likely to remember something that they thought of and experiemented than something a teacher just told them. Inquiry-based learning is something that I am new to, and very interested in implementing into my teaching. I love the idea of having students learn for themselves. I think creating a question and giving them a scenario is a good start to inquiry based learning. I would give them different tools and let them choose how to try and solve their scenario. Inquiry-based learing is beig used in my upper level science classes and I ave seen tremendous growth and retention in students. Although this is fairly new to our class and being incorporated with teacher guidance, I am certain with more time, these students will be able to critically think on their own with little input from me and I will just facilitate the direction their conversation goes. Im excited to see how well this turns out.